Borussia Dortmund remain in the bottom three of the Bundesliga after conceding a late goal to draw 2-2 at home to second-placed Wolfsburg. Naldo powered home an 85th-minute header for the visitors, who are 11 points adrift of leaders Bayern Munich. Dortmund went ahead when Pierre-Emerick Aubameyang slid in to score the opener before former Chelsea man Kevin De Bruyne levelled with a free-kick. Ciro Immobile rifled in from 20 yards, but the hosts could not hang on. Dortmund manager Jurgen Klopp insisted his team's performance, and that of £15.5m summer signing Immobile, was encouraging. "It has been a long time since I have seen a striker play like Ciro did," said Klopp, whose team will face Juventus in the last 16 of the Champions League. "Our performance was good in many ways and this is something we can build on." 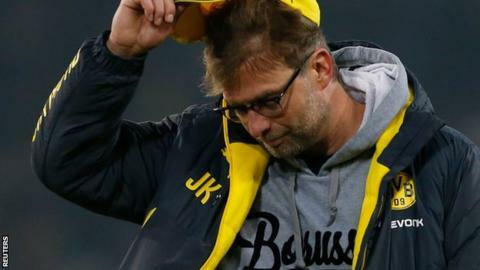 Dortmund, who finished last season as runners-up and were Champions League finalists in 2012-13, have now won only one of their past seven games. They are 12 points behind Bayer Leverkusen, who occupy the fourth and final Champions League qualification spot. Match ends, Borussia Dortmund 2, VfL Wolfsburg 2. Second Half ends, Borussia Dortmund 2, VfL Wolfsburg 2. Attempt missed. Erik Durm (Borussia Dortmund) right footed shot from the right side of the box is high and wide to the right. Assisted by Pierre-Emerick Aubameyang. Attempt blocked. Oliver Kirch (Borussia Dortmund) right footed shot from the right side of the box is blocked. Assisted by Pierre-Emerick Aubameyang. Naldo (VfL Wolfsburg) wins a free kick in the defensive half. Goal! Borussia Dortmund 2, VfL Wolfsburg 2. Naldo (VfL Wolfsburg) header from the centre of the box to the bottom left corner. Assisted by Ricardo Rodriguez with a cross following a corner. Corner, VfL Wolfsburg. Conceded by Ciro Immobile. Substitution, VfL Wolfsburg. Ivica Olic replaces Ivan Perisic. Corner, VfL Wolfsburg. Conceded by Neven Subotic. Attempt blocked. Daniel Caligiuri (VfL Wolfsburg) right footed shot from the centre of the box is blocked. Assisted by Maximilian Arnold. Attempt missed. Neven Subotic (Borussia Dortmund) right footed shot from outside the box is too high. Substitution, VfL Wolfsburg. Maximilian Arnold replaces Luiz Gustavo. Attempt saved. Ciro Immobile (Borussia Dortmund) right footed shot from the centre of the box is saved in the centre of the goal. Assisted by Erik Durm with a cross. Ricardo Rodriguez (VfL Wolfsburg) wins a free kick in the defensive half. Goal! Borussia Dortmund 2, VfL Wolfsburg 1. Ciro Immobile (Borussia Dortmund) right footed shot from outside the box to the bottom left corner. Assisted by Oliver Kirch. Bas Dost (VfL Wolfsburg) wins a free kick in the attacking half. Offside, Borussia Dortmund. Ilkay Gündogan tries a through ball, but Ciro Immobile is caught offside. Bas Dost (VfL Wolfsburg) wins a free kick in the defensive half. Attempt missed. Ciro Immobile (Borussia Dortmund) right footed shot from the centre of the box is close, but misses the top right corner. Assisted by Pierre-Emerick Aubameyang with a headed pass.